Hamish MaHaddie joined the RAF in January 1928 as a Halton apprentice, training as a metal rigger. He was one of a small group of US enlisted men selected for pilot training in 1935 and later as a Sergeant pilot he flew Wapiti bombers in Iraq. He joined 77 Squadron as a Sergeant pilot in 1937. He was commissioned as an officer in 1940 and became a legendary figure in Bomber Command. The Squadron lost its first aircraft of World War II, Whitley III, K8947 KN Q, on the night of 15-16 October 1939 when four aircraft, operating from a forward base in France took off in severe weather to drop leaflets over Frankfurt. They met little opposition but one of the Whitley aircraft failed to return. The aircraft’s pilot was Flight Lieutenant Roland Williams, a short service commissioned RAF officer aged 23 years. The aircraft was shot down by a light ack-ack unit near Darmstadt in Germany. The body of the Pilot was found beneath one of the Whitley’s engines. He lies in Durnbach cemetery. 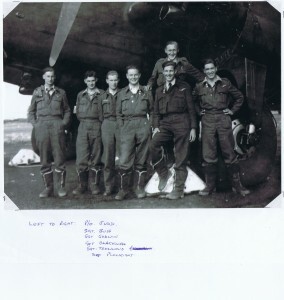 The remaining crew members, Flying Officer J.Tilsley, Sergeant J.W.Lambert, Corporals A.R.Gunton and R.Fletcher, survived to become Prisoners of War. In fact the operation had been cancelled but the wireless message was not received by the crew. Ron Gunton escaped three times from prison camp; the third time he broke back in when it began to snow! On the 15th March 1940 the Squadron flew a similar mission to Warsaw and it was on the return journey that an unusual incident occurred. F/Lt B.Tomlin in a Whitley V, with P/Off N.Parrott, Sergeant Charlton, Corporal Perry and Aircraftsman Erickson as crew, dropped the leaflets and turned for France. However they encountered adverse weather and following avoiding manoeuvres began to run short of fuel. Night navigation on these early flights was carried out almost entirely by ‘dead reckoning’ navigation, a system of estimation using heading and speed rather than known positions. The crew had little idea of their true position but they decided that they were over France and the pilot descended to find a place to make an emergency landing. Choosing what appeared to be a suitable field the pilot circled at low altitude and was promptly fired upon by anti-aircraft guns. Still believing that they were over France and that the fire was from friendly forces, the pilot switched on the navigation lights and lowered the undercarriage, indicating to those below that he was about to land. The shooting stopped. After a precarious landing on the uneven surface of a field, the aircraft came to a stop, and peering out the crew spotted a youth running towards the aircraft. The two Pilots jumped out to speak to him only to learn that they had in fact landed in Germany, 30 kilometres from the French border. Beating a hasty retreat they re-boarded the aircraft and were fortunate that the engines started immediately. Taking off they flew in the direction indicated by the youth, hedge hopping over the Siegfried Line, to land safely at Villeneuve, in friendly France. On returning to base, F/Lt Tomlin and his crew bought a bottle of champagne which they presented to the engine fitter of the ground crew to show their appreciation for the engines starting immediately whilst on the ground in Germany. The return, or more likely its re-enactment, was filmed by Pathé and shown in British and French cinemas. A university entrant who was granted a permanent commission in 1935, Embling commanded the squadron April to December 1942 having taken over from Wing Commander Bennett. After the squadron had returned to Bomber Command on the 2nd December 1942 whilst carrying out an experience operation on Frankfurt as second pilot in a Halifax with 102 Squadron he was shot down. He was captured but escaped with the help of the French and returned to the UK in March 1943. He did not rejoin the Squadron but but was posted to the Staff College and awarded a DSO. He eventually reached the rank of Air Vice Marshal before being killed in a jet Meteor aircraft accident in 1959. 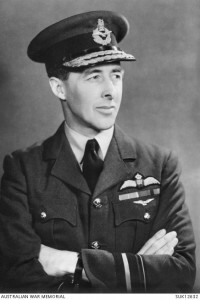 Wing Commander Donald C T Bennett commanded the squadron in 1941-2. He was born in Australia and joined the RAF in the 1930s. On the completion of his four years service he became a civil pilot and navigation specialist with Imperial Airways. In 1935 he wrote the first comprehensive British textbook on air navigation. In 1940 he headed a unit in Montreal set up to ferry aircraft across the Atlantic. In September 1941returning to England he joined the RAFVR as a Pilot Officer, was soon made an acting Wing Commander and helped set up an air navigation ground school in Eastbourne. He was posted in December 1941, to command 77 Squadron at Leeming. In March 1942 he was transferred to command 10 Squadron and to pilot a Halifax from northern Scotland for a special raid (by 31 Halifaxes and 12 Lancasters) aimed at sinking the Tirpitz battleship at Trondheim, on 27th April. Bennett was shot down but evaded capture to return via Sweden to England five weeks later. For this he was awarded the DSO. He was selected in August 1942 by AVM Harris to command the newly formed Pathfinder Force, PFF, whose job was to find and mark targets for main force crews. Promoted from Group Captain to Air Commodore in1943 and then to Air Vice Marshal, he left the RAF in May 1945. He died on 15 September 1986. On the 16th June 1944, on return from the raid on Sterkrade was Halifax III, MX705 K-NQ. After dropping its bombs it was attacked by a JU88 and severely damaged. The port side outer engine cut twice and the wing was on fire. The flaps were shot away and there was severe damage to the port side fuselage. Nevertheless the JU88 was hit by the gunners and burst into flame, it was claimed as destroyed. The Pilot headed for the emergency airfield at Woodbridge but the fire had spread so much that it was decided to ditch in the North Sea. None of the aircrew were injured either in the attack or in ditching. A Wellington on patrol spotted the dinghy and signalled that help was on its way. The aircrew was subsequently picked up by a patrol boat and taken to Lowestoft. The Pilot, P/O S E (Syd) Judd, was awarded an immediate DFC. His crew were F/Sgt G B.Buss, navigator; F/Sgt J Plowright, bomb aimer; F/Sgt J R Trengove RAAF, wireless operator; Sgt H T Godwin, flight engineer; Sgt R G Blackwell and Sgt D A (Tony) Rogers, air gunners. The aircrew was soon back on operations. Anthony (Tony) Rogers is standing behind the others in the photograph. The nephew of Sgt Tony Rogers, Bob Dodds, contacted us (November 2017), to say his uncle suspected that the enemy aircraft would shoot at them, so he stayed in his turret and waited after ditching. He brought up his guns as the aircraft returned to attack and he believed the enemy aircraft crashed. He and Sgt Blackwell received the DFM. Because it was accounted for, this aircraft was not officially included in the announcement of the number that went missing on this raid. Arthur Ernest Lowe was born in 1914. At the age of 16 he became an RAF apprentice at Halton and then trained as a Wireless Operator Mechanic at Cranwell. He became an air gunner with No. 208 Squadron in 1936. At the outbreak of war he was a Corporal with 77 Squadron and flew on several early raids in Whitleys. He was commissioned in March 1940. After completing his first tour he served in several training posts and rose to the rank of Squadron Leader within two years. He was popularly known as either “Lapper” or “Lofty” Lowe. In December 1942 he was promoted to the rank of Wing Commander and when, following the loss of W/Co Embling, he was appointed Commanding Officer of 77 at Elvington he became the first air gunner to command an RAF squadron. Although his appointment was at first resented by the flight commanders, who were pilots, he was soon accepted by all. After completing his second tour of operations in September 1943 (and awarded a DFC), he was posted to the Central Gunnery School. In 1945 he attended an RAF Staff College Course and remained in the RAF after the war as an administrator, becoming a Group Captain in 1956. He was appointed an MBE in 1942 and a CBE in 1961. He died in 2003. Flying Officer Robert Campbell Stewart, (130452) was born 7 July 1911 as the son of Alexander Campbell Stewart and Augusta Mary Campbell Stewart and was married to Doris Marjorie Campbell Stewart of Golden Green, Middlesex. He served with 77 Squadron as a Navigator and was shot down on 26/27 April 1943, (Halifax II, DT796) on the Duisberg mission and captured soon after. Flying Officer Stewart was one of the gallant prisoners in Stalag Luft III who took part in the meticulously planned “Great Escape” on the evening of 25 March 1944. He was recaptured later near Sagan, Poland and was last seen alive 31 March 1944. A post-war investigation concluded that he and forty-nine other Prisoners-of-War were murdered as a deterrent for future escape attempts. Flying Officer Stewart was cremated in Liegnitz, Poland and his ashes are buried in Poznan Old Garrison Cemetery, in Poznan Poland which is maintained by the Commonwealth War Graves Commission. Read more about this shocking episode. On the 3rd May 1943, Sgt. 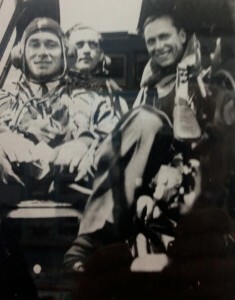 Francis E.Mathers, Royal Australian Air Force, was posted with his British crew to 77 Squadron. After five operations to heavily defended targets including Dortmund, Dusseldorf, Krefeld and Essen, he and his crew were detailed on the 22nd June 1943 for a raid on Mulheim. After the bombs had been dropped the aircraft was hit by flak and the starboard outer engine burst into flames. Three minutes later the aircraft was again hit and the port inner engine took fire. The fuel tanks were damaged and began to leak. The fires were extinguished but on the way home after the aircraft had crossed the coast it was attacked three times by a Me 110 fighter which the rear gunner Sgt.William.F. Speedie shot down. The aircraft suffered further damage when it made a wheels-up landing at Martlesham Heath. For his devotion to duty on this operation F/Sgt Mathers was immediately awarded the Conspicuous Gallantry Medal (CGM), the only one to a member of 77 Squadron, and soon after commissioned as a Pilot Officer. The rear gunner, Sgt. Speedie , and the Wireless Operator, Sgt Edward G O French, were both awarded the Distinguished Flying Medal. Sadly P/O Mathers and his crew were shot down and all killed on a raid on Mannheim on the 6th September 1943, they are buried at Durnbach, Germany. Flight Lieutenant Marwood P Braund and Flight Lieutenant John P Braund, twin brothers, both served on the Squadron as pilots at the same time. The former disappeared on a mine-laying operation in the Kattegat (Near Kiel) on the 12th January 1945 , and the latter in similar circumstances off the Danish coast on the 14th February 1945. None of their crew members survived. The latter’s body was washed ashore and he is buried at Skaelskor, Denmark. For more information about the Braund brothers go here. 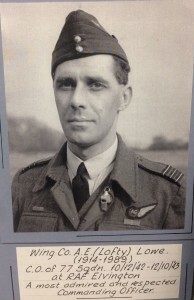 Chairman from 1994 of 77 Squadron Association and President from 2014 to his death in 2017, William A Foote joined the Royal Air Force in October 1941, aged 18. He undertook flying training in Alberta, Canada and went on to fly Wellingtons and Halifaxes. As a pilot, he carried out 37 wartime operations, flying from Full Sutton in Yorkshire, in 22 different Halifax MK111s between August 1944 and March 1945. He was awarded the Distinguished Flying Cross. After the war ended he stayed in the Air Force as a Flying Instructor until leaving in 1946. 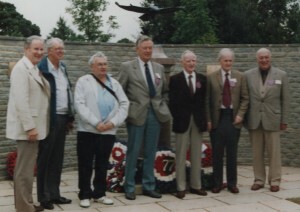 Members of his crew regularly met up at reunions. The last time they were all together was in 1989, see below. Bill’s memories are online here. He published his memoirs of his time in the RAF, entitled Me, the RAF and 77 Squadron. 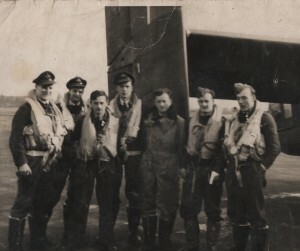 Photographs opposite: His crew in 1944 at Full Sutton, left to right: Doug Milton, Navigator ; Jack Patterson, Bomb Aimer; Arthur Pratt, Flight Engineer; William A Foote, Pilot; Len Scotcher, Rear Gunner; Paddy Dennehey; Mid-Upper Gunner; Colin Sutton, Wireless Operator. In 1989 at Elvington, in the same order.